Tim has provided us with some very good samples in his "Found Relatives" and you are certainly welcome to use them for this challenge. Or you may, as I did, use your own relatives. Our winner receives a £10 shop voucher from our wonderful sponsor, Country View Crafts as well as a blog badge and the opportunity to join us here as a guest for a future month's challenge. We also award 'Pinworthy' badges to 3 runners up. My fabulous team mates have out done themselves once again with some fantastic samples to inspire you - so lets take a look. 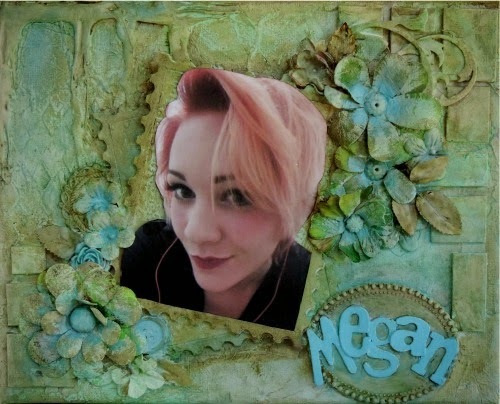 of our beautiful granddaughters, Megan. 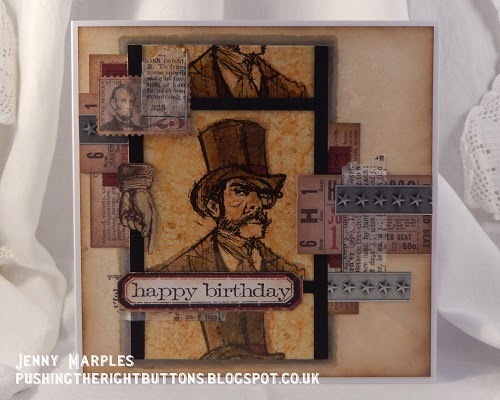 I used lots of Tim's grunge board punch out pieces on this project and the frame around the photo is his Postage Stamp Frame Die. I used plenty of Distress Paint and Stains also. Please stop over at my blog here to see the steps I took along the way. 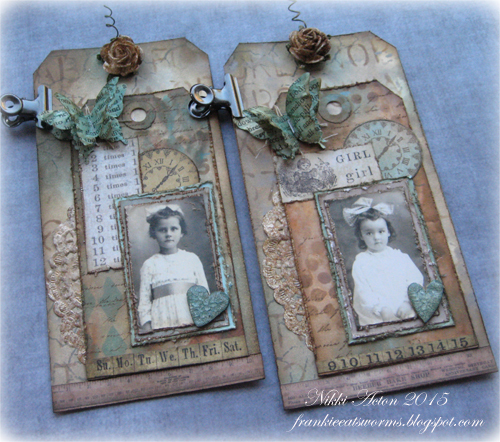 I had to use Tim's 'Found Relatives' for this challenge and then added lots of inked, stencilled and stamped layers and ideology elements to make my two tags. I added in some non Tim stuff too - my scrunched butterflies and flowers. Lots more to see over at Addicted to Art today, be lovely to see you there. 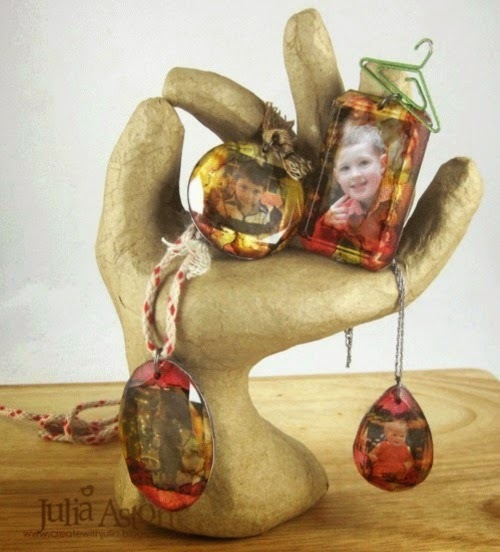 S@ndy's challenge inspired me to take some photos of my adorable grand-nephews and nieces, resize and print them, and using Tim Holtz technique for Tinted Fragments, I created some Portrait Jewelry with Idea-ology Facets! You will find lots of pictures and details on my blog post here. I went in all sorts of directions before deciding a Found Relative was the way to go for S@ndy's great challenge. 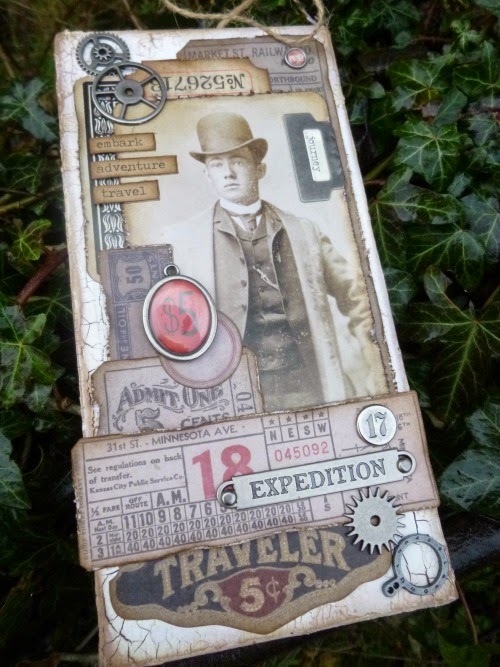 I added lots of other Idea-ology ephemera and metal to celebrate this young man's journey westward, seeking his fortune. 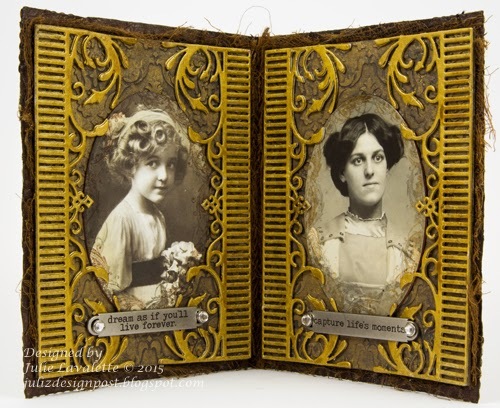 The whole thing is built on a chipboard icon, with a weathered crackle background. Come over to Words and Pictures to see all the details. I know that Christmas is now a distant memory but it is still winter and I wanted to use one of Tim's Found Relative portraits, the boy with skates to make a 3D piece for S@ndy's wonderful challenge. You can find more details over on my blog. 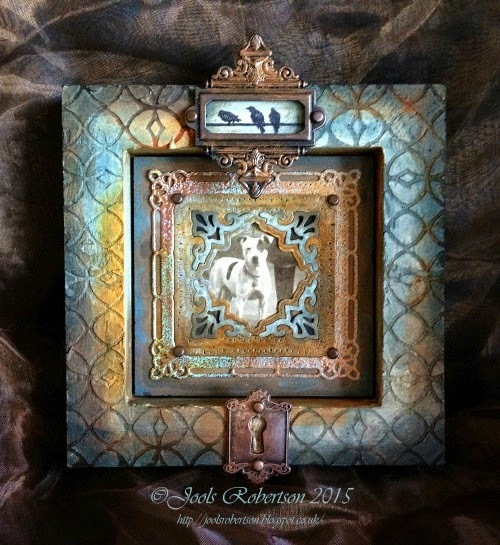 I had the idea of making a Vintage Travel Photo Frame and came across an image of an Antique one on the Internet and was now totally inspired. Using a variety of Tim's products and techniques I was able to replicate this in my own interpretation. Hope to see you over at my blog to see the full 360 degrees of my project. I have used a school photograph of my mother for my canvas project and used Distress colours which I know she would have loved. 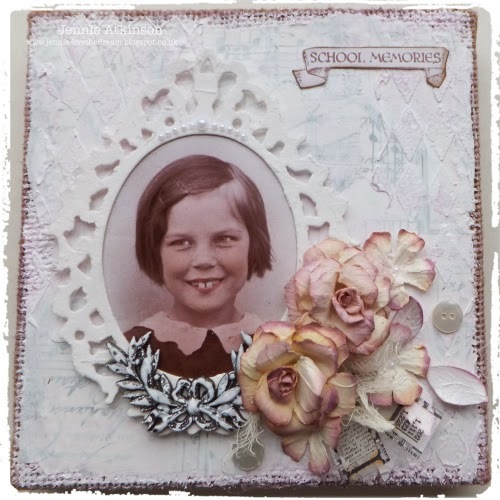 I tried to create a different effect with my handmade flowers for this project and have blended coloured Distress Inks on my Tattered Florals roses instead of the usual Vintage Photo. Hop on over to my blog if you want more details and a tutorial for the roses. So a pet portrait was a must and here's how I made my frame using a variety of techniques and products, please click here for more details. So this is my take on 'new fangled' 19th Century portraits; in times gone by the rich and famous would be recorded for posterity in a painting, but with the advent of photograph it became possible to capture those faces on film and make as many copies as you liked. Now we take our own portraits, or 'selfies', but back then you had to take a trip to the local photography studio (unless of course you could afford the photographer to come to you)! Step forward my self-made man and famous US industrialist "Gordon H. Booth"... find out how I captured his likeness over at my blog. I have used a Worn Cover for my project and kept the front 'less is more' because there are lots of details and portraits inside. 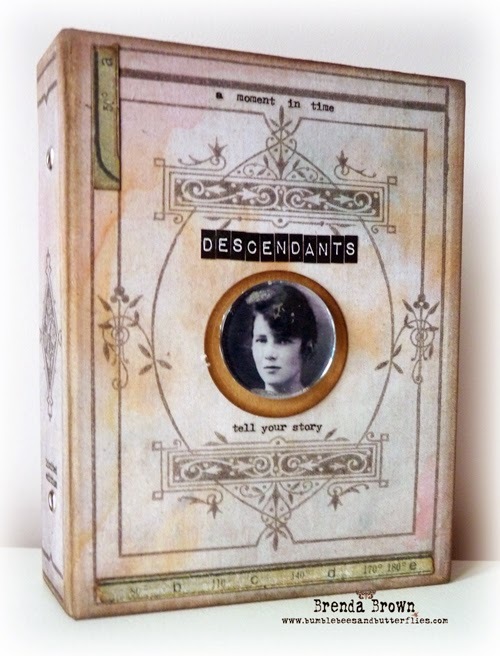 Using Tim's Idea-Ology range and other bits and pieces this has become a special family piece showing five generations of girls from my grandmother (that's her on the front cover) to my grandchildren. Click my name above the photo to see what is revealed when the book is opened. What a great job of inspiration from the team - I know I certainly feel the love for this challenge. We can't wait for you to join us with your creation. I am overwhelmed by these inspiring projects from the team. 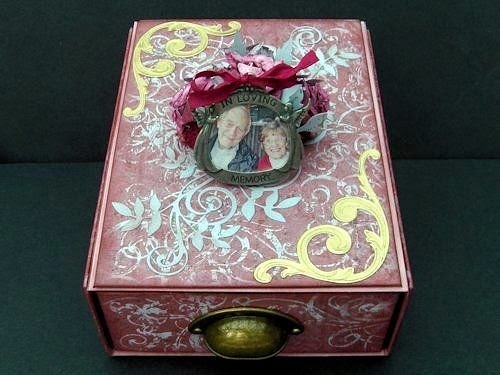 We have portraits of all sorts of relatives, both real and found from all generations along with our beloved pets. Thank you, I'm looking forward to seeing what everyone else makes. What a wonderful variety of Portraits here ladies! Each so creatively designed and executed! I'm off to visit to get all the details! These are all awesome inspiration for portraits! Love it! Absolutely stunning each one of them! Lovely portraits and very inspiring, Ladies. Oh wow ladies, you have out done yourselves once again! Amazing projects from you all!! Off for a closer look....oh and thanks for the inspiration! Wonderful, wonderful projects from the team and S@ndy's choice of theme is fantastic. I am so looking forward to seeing what everyone comes up with! Just been over to visit everyones blogs. What fantastic inspiration and step by steps, very enjoyable visits. Look forward to seeing what everyone else makes now. What a fantastic lineup of talent from the DT! Great challenge theme, Sandy! Will be by to visit all of you for all the details! Hugs! Wow! What a fabulous collection of inspiration! Thanks for the eye candy to look at and for another fun challenge! Thanks for inspiring to use my stash and enter the challenge - some great projects from the Design Team!! Thanks for the inspiration, I've just added my link! What a fun challenge! The DT has out done themselves again...such wonderful inspiration.